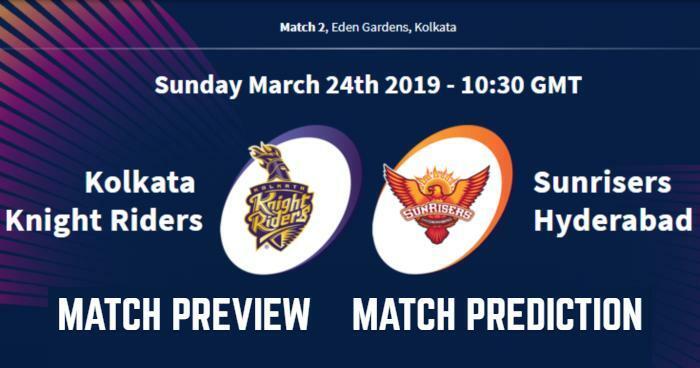 Home / Eden Gardens / IPL / IPL 12 / IPL 2019 / IPL 2019 Match Preview / KKR / Kolkata / Kolkata Knight Riders / SRH / Sunrisers Hyderabad / IPL 2019 Match 2 KKR vs SRH Match Prediction, Preview and Head to Head: Who Will Win? 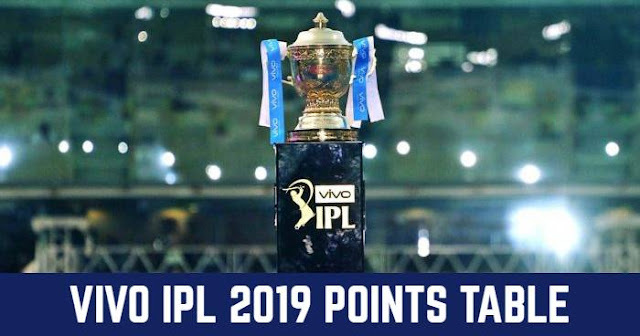 IPL 2019 Match 2 KKR vs SRH Match Prediction, Preview and Head to Head: Who Will Win? Kolkata Knight Riders (KKR) will take on Sunrisers Hyderabad (SRH) in the 2nd match of the 12th season of Indian Premier League (IPL 2019) on 24th March 2019 at Eden Gardens, Kolkata. As far as weather is concerned, the temperature will be between 35ºC to 30ºC with humidity below 40% and slow wind around 7-8 km/h. The pitch looks like an absolute belter. Perfectly rolled and has a good sheen. There's gonna be loads of runs. The pitch has an even grass covering too. So that means the new ball will do its bit. Kolkata Knight Riders and Sunrisers Hyderabad both teams were among the top four teams last season at the end of the league stage; while Sunrisers Hyderabad were table toppers at the end of the league stage and ended up losing against Chennai Super Kings in the final on the other hand Kolkata Knight Riders progressed to the playoffs and lost to the KKR in the Qualifier 2 and finished third. Kolkata Knight Riders were understaffed in the IPL 2018 with only 19 players but did a good job at IPL 2019 Auction. Retaining their core team which helped to finish in the third place and almost revamped their entire bench strength. KKR added new options to choose from in the fast bowling department with including foreign pace and all-rounders. Despite this, KKR have suffered from disappointment before starting the tournament; due to three injuries in their pace department. South African fast bowler Anrich Nortje had to pull out because of a shoulder injury. And injured Shivam Mavi and Kamlesh Nagarkoti is replaced by Sandeep Warrier and KC Cariappa. Sunrisers Hyderabad have retained almost their entire and showed immense faith in their squad of 2018 that helped them to do so well last season. Return of David Warner will be the biggest advantage for SRH despite that SRH will play under the captaincy of Kane Willamson. But there is a chance that Kane Williamson may miss this match due to injury. But the absence of opener Shikhar Dhawan will be a place to fill. Kolkata Knight Riders (KKR) and Sunrisers Hyderabad have played 15 matches in Indian Premier League (IPL) against each other; 9 are won by Kolkata Knight Riders and 6 are won by Sunrisers Hyderabad. In Last 5 matches, Kolkata has won 3 of them and Sunrisers Hyderabad have won 2 matches. They have met three times in IPL 2018 and KKR won once and SRH won twice including in Qualifier 2. Kolkata Knight Riders and Sunrisers Hyderabad have played 7 matches against each other at Eden Gardens, Kolkata; out of which first 5 matches are won by Kolkata Knight Riders and last 2 are won by Sunrisers Hyderabad. Toss will be an important factor, the toss-winning captain would like to bowl first. 180+ score match can be expected on this wicket; seeing both teams line-up, hard-hitting batsmen in both teams will make a high scoring match. Sunrisers Hyderabad will be playing with their test playing XI while Kolkata Knight Riders will be trying to find their suitable playing XI. With batting dominant in the SRH will have more advantage over KKR young bowlers. On the other hand, SRH have the best bowling combination in IPL 2019. In our prediction, Sunrisers Hyderabad are more probable to win this match. KKR Squad for IPL 2019:Dinesh Karthik (c & wk), Carlos Brathwaite, Sandeep Warrier, Kuldeep Yadav, Shrikant Mundhe, Harry Gurney, Sunil Narine, Piyush Chawla, Nikhil Nayak, Lockie Ferguson, Prasidh Krishna, Andre Russell, Shubham Gill, Nitish Rana , Chris Lynn, KC Cariappa, Rinku Singh, Joe Denly, Prithvi Raj, Robin Uthappa. SRH Squad for IPL 2019: Virat Kholi (c), Mahammed Siraj, Marcus Stoinis, Moeen Ali, Nathan Coulter-Nile, Akshdeep Nath, AB de Villiers, Shimron Hetmyer, Parthiv Patel (wk), Milind Kumar, Yuzvendra Chahal, Navdeep Saini, Tim Southee, Colin de Grandhomme, Pawan Negi, Devdutt Padikkal, Shivam Dube, Himmat Singh, Kulwant Khejroliya, Umesh Yadav, Gukreet Mann Singh, Heinrich Klaasen (wk), Washington Sundar, Prayas Ray Barman.